I don't think it'll be addressed because other users seem to have been requesting the same thing for the last 7 years, but is there any reason why Fences ignores and overrides my Windows 10 settings to disable all animations? Without Fences installed moving an icon on the desktop happens instantaneously. With Fences installed an animation is applied - the icon goes back to where it was originally and animates from that starting position back to where I just dropped it. Apart from being completely pointless isn't it bad practice to ignore a user's Windows setting? I'd prefer no animation to happen within a Fence too, but why apply an animation to desktop icons that aren't even being dragged to/from a Fence? This isn't an animation. It is a function of Windows. You should right click the desktop and set icon behavior there. Make sure that auto arrange and align to grid are unchecked. The acid test is does moving an icon on the desktop behave the same when Fences is installed and when Fences is not installed, and the answer is no. My (preferred) Windows settings are 'Auto arrange icons' [unchecked] and 'Align icons to grid' [checked]. As I mentioned above I've set Windows animations to off in Windows settings. 1. With Fences not installed, when an icon is moved it just snaps to the closest grid. No animation. 2. With Fences installed, when an icon is moved, when dropped it first goes back to where it originally was, then it animates back to the point it was dropped. The only change to the system is installing Fences. Sure, as you suggest, unchecking the 'Align icons to grid' option stops the (new and unwanted) animation, but a user shouldn't have to turn off the alignment option just to stop an animation that appears only when Fences is installed? It seems I'm not the only one who's noticed that installing Fences adds an (unwanted) animation when simply moving icons on the Windows desktop. An animation that wasn't there before. both of which went unanswered. I don't develop software applications any more but surely it's not good-practice for a developer to ignore a user's Windows setting - i.e. animations disabled - and just add some gratuitous animations in for no real rhyme or reason? I'm trusting that someone from Stardock takes a look at it this time and suggests that the developers tweak the app so that the animation is either made optional, or it respects the user's Windows settings. I am a Windows 10 - 64bit user, and I just bought v3.0.5 today through Valve's Steam, and I can say, Fences is very neat program and functions great and it does all what I wanted from it. Except that "Move Icon Animation" feature, which makes desktop icons be moved around at a much slower pace and speed (with a 1 or 2 seconds-long animation instead of instantly). I don't find it useful, as it is too slow for my tastes, and pretty annoying. Since my work on desktop involves extensive use of Desktop, this "Move Icon Animation" can quickly become a nuisance. By default, dragging icons around the desktops takes absolutely no time - they are moved instantly. That is how Microsoft has set it (and for a good reason!) However, after installing Fence, now I get this move animation played every time I am moving icons around my Desktop. 1-2 second-long animations may not seem too much for you, but they really are! Trust me - speed matters greatly for some people such as me. 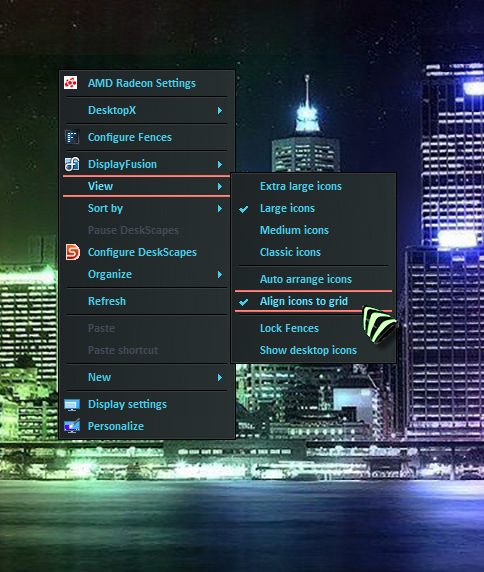 Stardock, you have developed an awesome software, but please add the option to disable/turn off "Move Icon Animation" for Fence users, so as to allow the icons move instantly around the desktop! I miss now the Operation System's default instant icon moving and I hope next update will solve this.! I've been looking everywhere for a solution to this problem and am getting real tired of seeing all these forum posts be ignored. I don't care if I'm necroing, I just want this fixed. If there's no option to disable the damn thing, SOMEONE MAKE ONE. It's annoying. Thanks for the suggestion scorpNZ. I couldn't find a support link so incorrectly thought that this forum was Stardock's way of managing support. I've since found the support link, raised a ticket and it's been confirmed that a fix for this will be included in the next patch. I am not sure, since I do not see any lag when moving icon between fences. I do see a less than a second animation if move the icon from desktop to fences, when it align itself into its grid. Which is normal/typical for me. Anyway, I have forwarded your problem to Stardock Support team for their assistance. Please keep an eye on this thread for any updates. We appreciate your feedback and patience. hello? is there any update on the issue yet? No update on this issue yet. Hi, Could you please tell me which skin of cursorFX that you are using. Thanks. Is there any update on this issue yet? I wish to refund my purchase since this one thing is literally preventing me from wanting to use the software at all because it makes the desktop obsurdly laggy and slow. Can't you request for this to be fixed? My business requires this for our personal/work computers. We don't want to request refunds right away without you guys giving a shot on fixing it because thats over 80 keys we will have to request refunds for. My concern is if this dumb animation does no benifit for the users what so ever, Why keep it? This animation is literally considered a "downside" on reviews for the software. It would be mutually beneficial to both your and my companies if this was fixed already. Just giving a bump to this issue. First thing that confused me was that after the Installation the automatic arrangement of Icons had turned itself on. Lastly and most importantly, the grid movement animations are what currently stops us from buying Fences, which is a great product apart from that.